When I was a junior in college, I spent my first summer away from home with no cafeteria. In preparation, I picked my father's brain for instructions on making my favorite vegetable soup, pinning him down on a specific number of onions, potatoes, tomatoes, and more. But it was a struggle to turn Daddy's words into a recipe, because that wasn't the information he was trying to impart. Over a decade later, I've finally figured out what my wise father was saying. Yes, I am a slow learner. Daddy was teaching me the trick of cooking in season with the easiest in-season recipe --- harvest catch-all soup. He was trying to get through my thick noggin the notion that meals should begin in the garden with what's fresh and numerous, rather than with a detailed shopping list at the grocery store. Clearly, this soup had been his mother's way of using up odds and ends --- bits of browned carrots, wilted greens, anything that wasn't rotten but wasn't prime enough for being served plain. 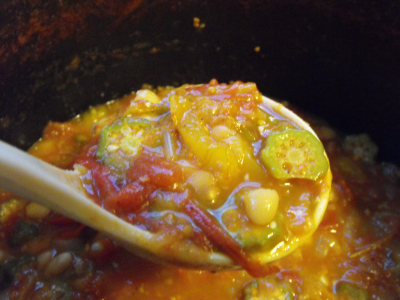 And, in essence, the soup was simple --- make a stock, then throw in whatever vegetables you have lying around. The first step was to make a soup base. Daddy's method involves one onion, some garlic, and a cup and a half of cabbage all sauteed in a bit of oil, then simmered for a couple of hours with two stalks of celery, an 18 ounce can of tomatoes, and enough water to fill up the pot. 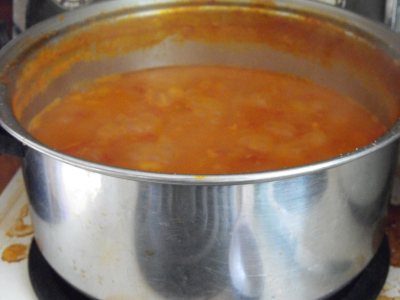 My method (at the moment, and ever evolving) starts with three quarters of a pot of halved tomatoes, enough chicken stock to submerge the fruits, two onions, six big cloves of garlic (minced), a big handful of parsley (chopped), and about half a cup of dry beans (pre-soaked.) This is the part of the soup where you'll want to follow a vague recipe, but you'll notice that parsley is a great substitute for the much harder to grow celery, and that if you start with stock you don't need to bother with the sauteeing step. This is also where you can tweak the flavor to suit your particular tastes. After simmering the soup base for two or more hours until it has halved in volume, you can pretty much throw in whatever you want --- preferably whatever's in season that you're sick and tired of freezing. 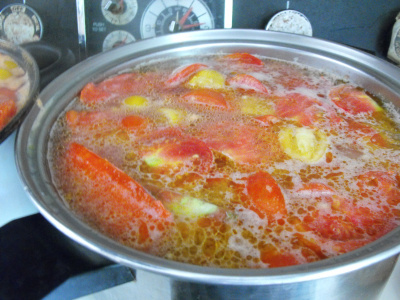 Vegetables will cook in a bubbling pot of soup stock at about the same rate as they cook in a pot of boiling water, so add the veggies a minute before you eat (for sweet corn), ten minutes before you eat (for beans, okra, summer squash, etc. ), or forty-five minutes before you eat (for potatoes.) You can make the soup into a stew like Daddy's, chock full of so many vegetables that it should be eaten on a plate, or you can keep your soup more Cambell's-like and just add in perhaps a quart of vegetables in the final step. Daddy concluded his lesson with these words of wisdom: "Use a big pot. Your soup will expand to fill the space provide." 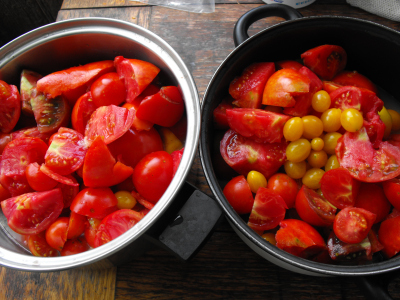 Nowadays, I make two pots of soup at once during harvest time, the better to concentrate summer goodness for winter delight. Our homemade chicken waterer never spills or fills with poop. Historical background. My mother's father died before she, the youngest of 12, was born. She was eleven when the great depression began. So hard times was a way of life for her. I relived times of scarcity through her. Her mantra was "waste not; want not." Would that she'd taught it to the world. One of the things I love about making soup is that you can throw in pretty much anything edible and end up with something good - no need to measure anything, no need to worry if you don't have exactly the "right" ingredients, no following a recipe at all (or only using one as a guideline the first time you make it, heh). I just keep tasting - and smelling - through the process, and even if it's different every time, it's always delicious, so you can't complain! That being said, I've never actually made a soup starting with a base of tomatoes (I tend to save the tomatoes for sauce and salsa). I'll definitely have to try this the next time I make soup! And thank you, Errol, for the background information - "waste not, want not" is a good motto by which to live. It is hard to decide where to put a limited crop of tomatoes. We're halfway to our goal on pizza sauce and spaghetti sauce, which are what I consider most important, so I figured I could get away with making a few batches of soup. Tomato-based soups are just so delicious! In a large pot mix 4 cups stock (chicken, vegetable, or a mix), 1 28 oz can tomato puree (or about 3 cups pureed home grown tomatoes), and a big handful/1 bunch of julienned fresh basil (or about 2 ounces of that "fresh" basil puree from the chilled produce section, or a small handful of dried basil), a can of Rotel (or about 1/2 cup green chili peppers, or whatever peppers you have available for desired spice), and optional diced onion and/or celery. Simmer until thickened (reduces maybe 1/3-1/2). If desired, add cooked, shredded chicken for last 10 minutes. Take off heat, let cool about 5-10 minutes, add a big splash of heavy or whipping cream, salt to taste. Stir and serve. This phenomenal with a grilled cheese sandwich on a cold day!